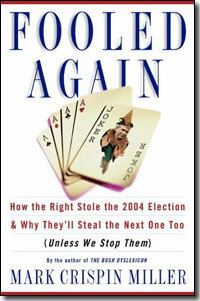 This week, we've seen a resurgence of interest in the topic of the theft of the 2004 election, thanks to Robert F. Kennedy Jr.'s massive "Was the 2004 Election Stolen?" article in Rolling Stone, (which you can read online here). Additionally, investigative reporter Greg Palast has posted his latest investigative piece on the topic of the 2004 election theft. As Palast notes in his article, "239,127 votes for President of the United States were dumped, rejected, blocked, lost and left to rot uncounted." The raw exit poll data from the 2004 election has never been released to the public. Instead it has been kept under lock and key, away from the prying eyes of scholars and researchers who've been demanding access to this data. In a perfect world, the Dems will retake Congress in November. They'll then start impeachment proceedings against Bush and remove this tyrant from office. Alas, we don't live in a perfect world. I suspect the GOP will retain the Congress and there will be all kinds of stories of voter fraud and disenfranchisement (which the mainstream media will of course ignore). At the end of the day, we'll still have the GOP in power and the vague feeling that, once again, the election was stolen. I don't blame Al Gore for not running. What sane person would want to be elected as a Democrat president these days and then have to face four long years of the right's attack dogs spewing endless lies about you?